We entered into an open courtyard full of people. On the central tower hung an enormous tapestry with a many images - this tapestry is only hung once every two years, remaining folded for the rest of the time. There was already a long line of people of all ages waiting for a blessing, and people were taking up their positions seated on the ground around the central square, or on the balconies above looking down, where there were also seats for the VIP guests. By nine the musicians and dancers were gathering in the inner courtyard of the monastery. The inner courtyard is surrounded by a group of decorated white towers, one of them being the main temple for worship. 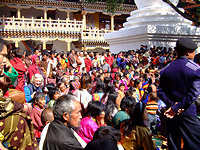 A large group of monks waited for the Je Khenpo (Chief Abbott of Bhutan) to appear from his winter residence here in the Punakha Dzong. 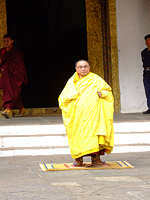 When he finally came out, the monks gathered round him for blessing. Afterwards, the day's festival began with a procession of musicians, playing and drumming on their musical instruments, followed by the girl and boy dancers and finally by the monks and Chief Abbott. The musicians and dancers went out into the main square, the monks and Chief Abbott walked up to the second floor gallery of the building where a special box facing the main square had been made for the Chief Abbott. He would remain there for the rest of day throughout all the festival performances. He would also be there everyday for the rest of the festival. 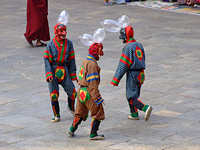 Three clowns also entered the square with the dancers. The clowns remained in the square throughout the day's performances mingling with the crowds and even the dancers and performers. The boys and girls group began their dances. This first gentle dance group was replaced by a group of colourful and elegantly dressed male dancers. They wore hats decorated with butterfly-like wings and a large round feather decoration on the top. Long and colourful material streamers tied to the back of the hat like dragon tails rested on the back of the dancers. The costume was complicated and heavy looking, with enormous sleeves flapping and opening up as the dancers moved, Their long sleeve, skirts and hat streamers whirled through the air forming a multi-coloured rainbow turning and turning in a circle, reminding me of certain male birds opening their wings and feathers to make an impressive display for the female bird. The next group of dancers to perform were wearing animal head masks, followed by another group with different masks and costumes. 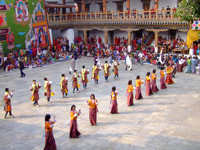 A group of monks walked into the square in procession followed by a new dance group in simpler clothing, who began their dance, jumping and bowing towards the altar and the large tapestry. When the dancers had finished their ritual the large tapestry began began to be lowered from the tower, slowly descending as the helpers at the base of the tower rolled it up. The whole tapestry was rolled into a long tube and carried away by many people. It was a dramatic performance. Several dances followed, during which I was so happy enjoying myself and laughing with the local people. I was sitting among a group of young monks and totally happy without a worry. My mind was entirely occupied by the beautiful costumes of the dancers, their acrobatic dance, the laughter and happiness of the local people and their families. If I had any worries, unhappiness or anger in my heart it was not there to be found on that day. I was interrupted by our guide because it was time for us to go to other places on our list for that day. I had watched the performance for almost 3 hours that morning but it was not enough.